It’s the UK, it’s winter, it’s wet – you’re going to need a waterproof jacket. 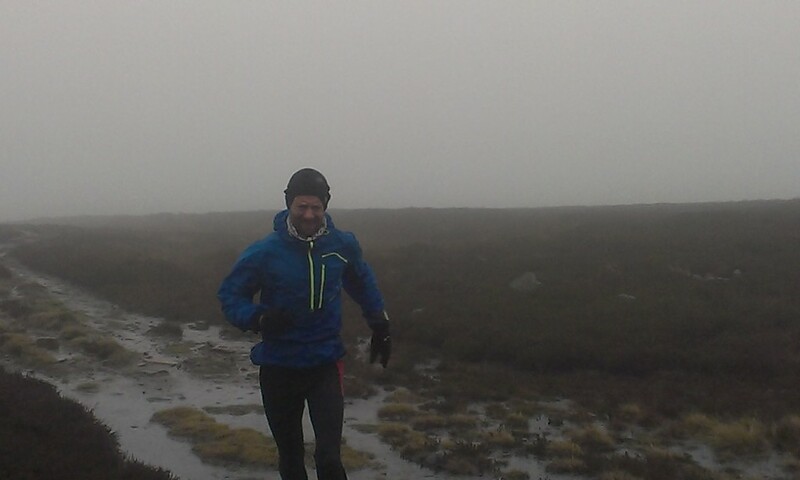 For anyone heading out for a run on the fells in winter a waterproof jacket is essential. Even in the middle of summer the weather can be wet or unpredictable, where sunny summer mornings can lead to heavy afternoon showers, especially in the mountains. And if you’re planning on entering a fell race you’ll need to carry waterproofs for certain races even if there’s a heatwave. With such a wide range of choice it can be difficult to know the best jacket to buy and I often get asked for advice on what’s best. 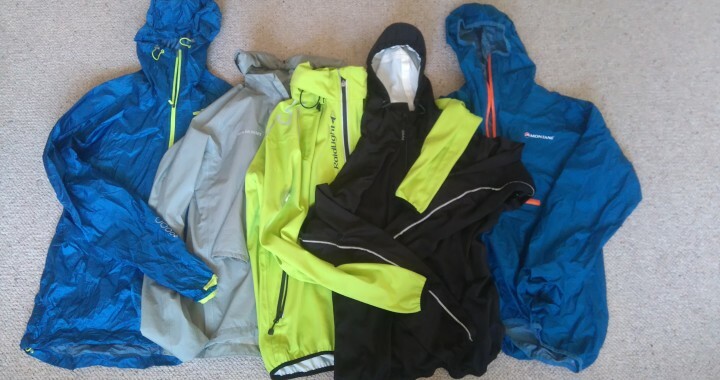 Here I compare five jackets specifically designed for running and look at the pros and cons of each one. Note: the weights are for a size small and were measured on my kitchen scales rather than giving the manufacturer’s figures. If the jacket is going to be used mainly for fell races, often being carried in a bumbag rather than worn, then light weight and a small pack size are probably your priorities. However if the jacket is more likely to be worn on a day to day basis then a slightly heavier, more robust top might be a better choice. A very lightweight, minimalist top might not stand up to being worn under a running rucksack on a regular basis and so again a heavier, more durable one would be better. A smock is a top with a three quarter length zip whereas a jacket has a full length zip and there are advantages and disadvantages to both. 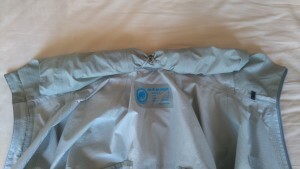 A full length zip may be a little heavier and give a larger area where water can get in (i.e. through the zip itself and the associated stitching). 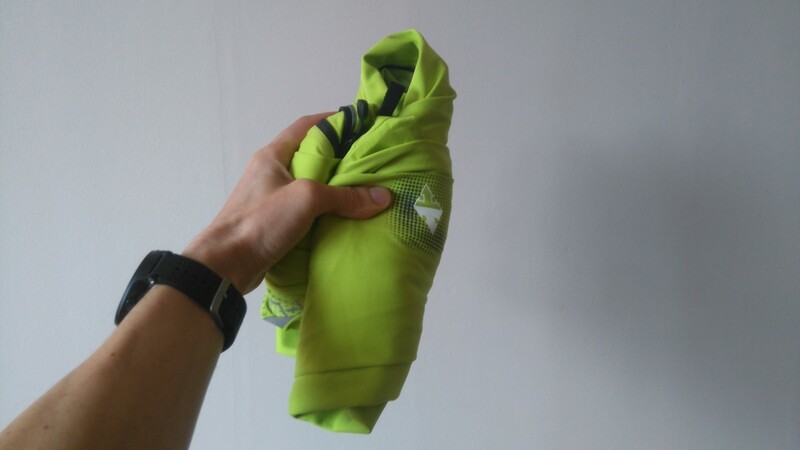 If you stop to put a jacket on mid run and suffer with cold hands you might struggle to do up the zip (whereas with a smock the zip never separates at the bottom). It is easier to put on and take off a jacket as you don’t have to pull it over your head and a full length zip allows greater venting (e.g. when it stops raining and you want to avoid overheating but don’t want to take the jacket off). Fixed Hood or Roll Away? Some jackets allow you to roll the hood away when not in use. If you prefer to run with the hood down this is a good feature, particularly in windy conditions, as the hood doesn’t blow about and whack you in the face. Pockets and Adjustment Cords – do you need them? I find a zipped, chest pocket to be a great feature; ideal for keeping map, compass, food etc close to hand and accessible whilst on the run. However you may be happy to use a bumbag or rucksack for carrying such items. Also think about the placing of the pockets; for example will your rucksack strap prevents access to them? Some jackets allow you to tension the hem and hood, usually via elasticated cords. The ability to get the hood nice and snug is great in wild and windy weather – but if the adjustment toggle then whacks you in the eye the feature loses its appeal! Wired hood can be tensioned for volume and size around face. Roll back using velcro tab. Elasticated cuffs with thumb loops. Great hood that can be adjusted to get a good, tight fit for really bad conditions. Feels a bit more substantial than some other lightweight tops. The chest pocket is a bit small. Longer runs or races when I need to carry, rather than wear a waterproof or for wearing when racing in prolonged wet conditions. Elasticated hood which can be rolled back using velcro tab. Very lightweight and packs to a tiny size. Huge pocket swallows larger maps and other items. The hood can’t be tensioned and so flaps in strong winds. Hood roll back system doesn’t work very well and tends to come undone. Hem can’t be tensioned and so rides up. This is my preferred waterproof for most races where a top needs to be carried to comply with race rules. I also use it for shorter training runs in wet conditions. 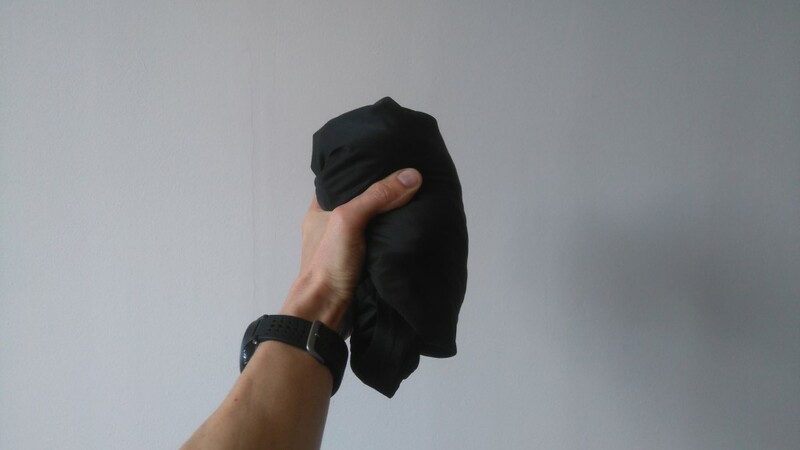 Elasticated hood which can be rolled back using a small hook. Very lightweight and packs to a tiny size. The hood can’t be tensioned and so flaps in strong winds. Small chest pocket. 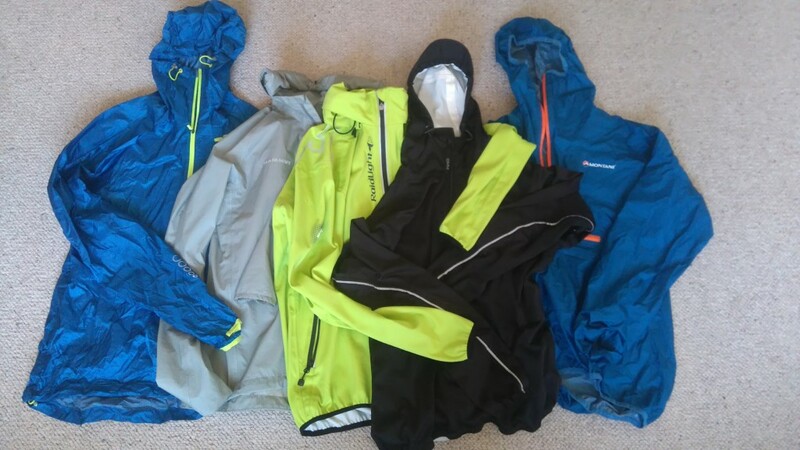 This jacket is very similar in weight and size to the Minimus and tend to use it for short, wet weather training runs or occasionally as my racing waterproof for packing into a small bumbag. Roll away hood with toggle tensioning around the face. Elasticated cuffs with thumb loop. 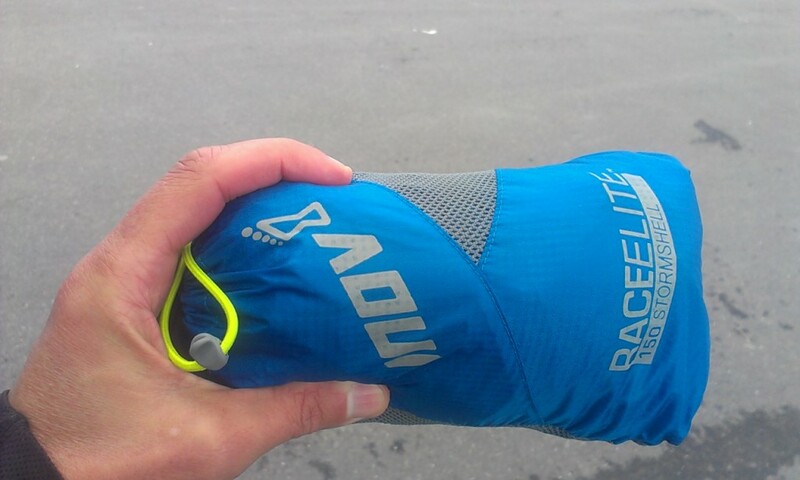 The Raidlight has a soft-shell feel and is slightly stretchy which makes it comfortable to wear. It feels more like a top that you would wear all day regardless of if it was raining and I like to wear it on colder days even if it is dry. 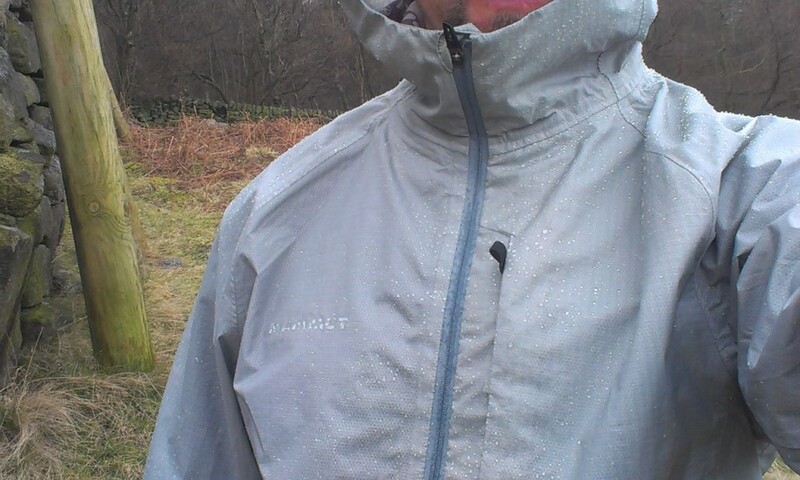 It offers more warmth than the other waterproofs reviewed here. 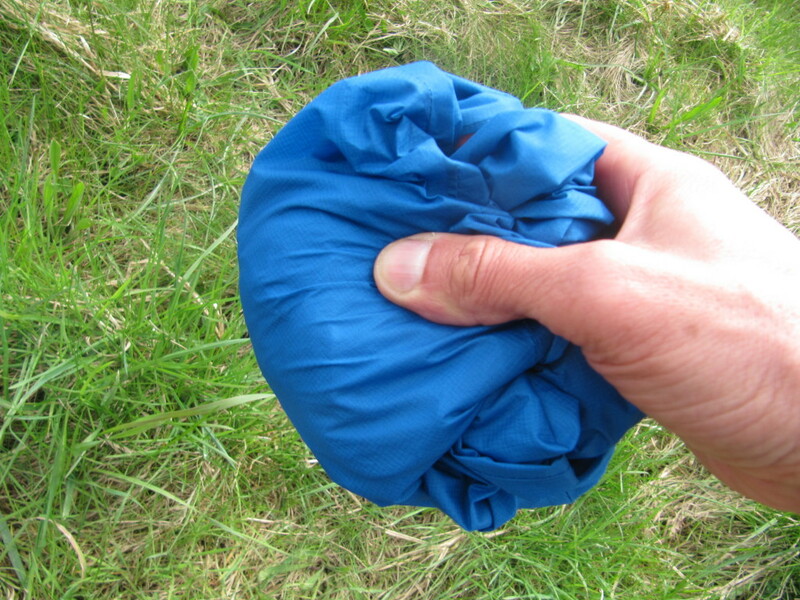 The twin pockets are good for carrying bits of kit but get covered up by a bumbag or rucksack strap. The hood is tensioned by toggles which then become lethal whipping implements in strong winds if not adjusted correctly! 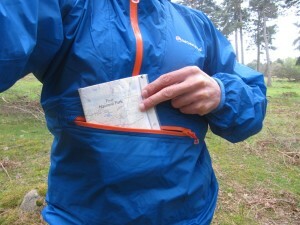 Waist pockets can be hard to access when wearing some bumbags or rucksacks. Not sure about the fluorescent yellow! This is the jacket I use for work in cold weather as a wear all day item, regardless of if it is raining or not. I also wear it for easy runs in cold weather. 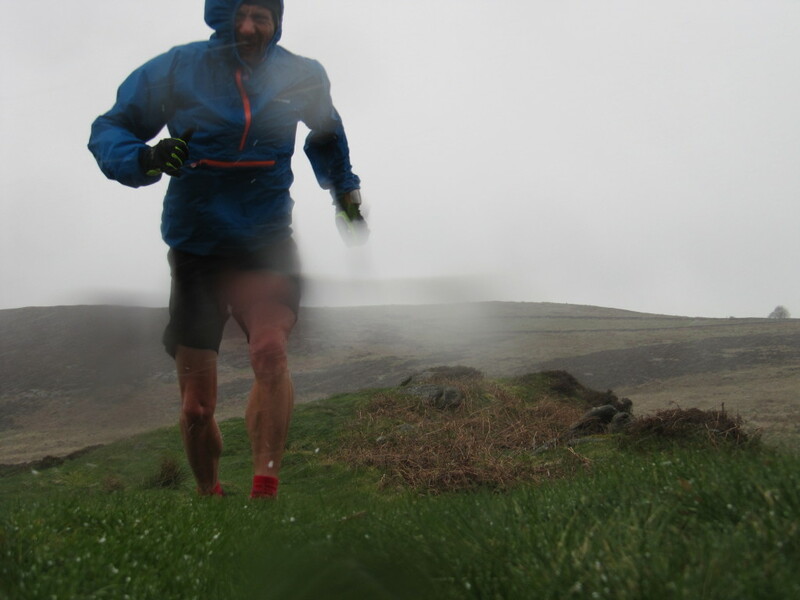 I wouldn’t consider the Raidlight as a race waterproof due to its size and weight but this does make it more suited to conditions when I know I will be wearing it all day. Hood can be tensioned for volume and size around face. Roll back using velcro tab. Slightly stretchy material gives a snug, comfortable fit. Feels both light enough to use as a race top yet robust enough to wear day in day out. Good adjustable hood can be fitted tightly for bad weather. 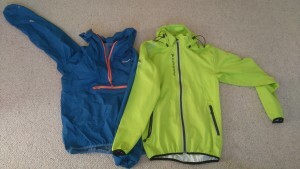 Slightly more robust than some of the other lightweight jackets reviewed here. Adding a wired visor would make the hood even better. I’ve had version 1 of the smock for over five years and it’s still going strong. It is my preferred top for running work which usually means wearing a running rucksack. It has stood up well to the abrasion of shoulder straps and general use. On the original version the chest pocket was on the inside (a terrible idea as you had to unzip your main zip to access it and thus let the rain in! ), but OMM have now placed this on the outside of the jacket. For me the Kamleika is my work jacket although I would consider it as a race jacket if I didn’t have others. As with many things there is an element of personal choice when it comes to features and there is always a balance or compromise to be found. 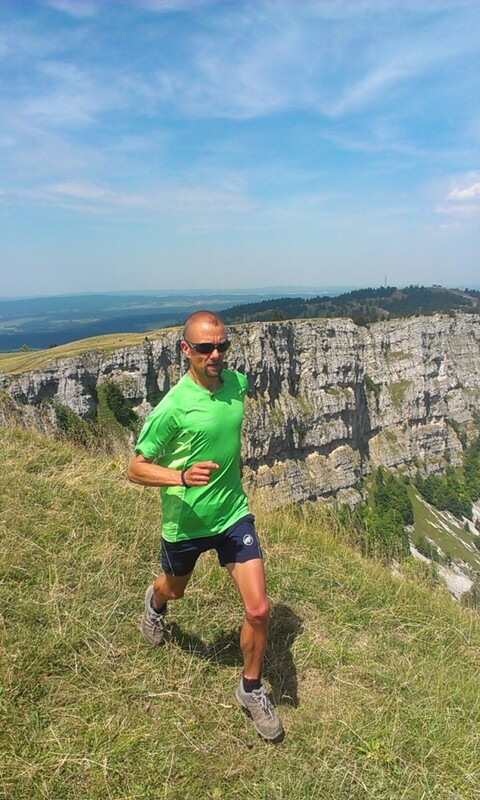 Your super-light, minimalist top might be good for a short fell race but less so for a full day on the hill. A thicker jacket might last longer and keep you warmer but is too big to get into your bumbag. It might be that you can convince yourself (and less understanding significant others) that you need more than one jacket! I have yet to find “the” best waterproof for trail and fell running, just some that do some things better than others in different conditions. 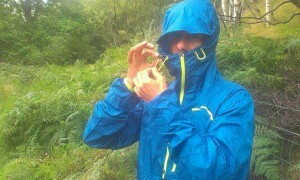 When running in heavy rain I still get damp, either by water getting through the membrane or by sweat failing to escape. Brand new jackets work well, with water “beading” on the surface for a few runs but soon lose their water repellency and tend to “wet out” even despite regular cleaning with the manufacturer’s recommended products. 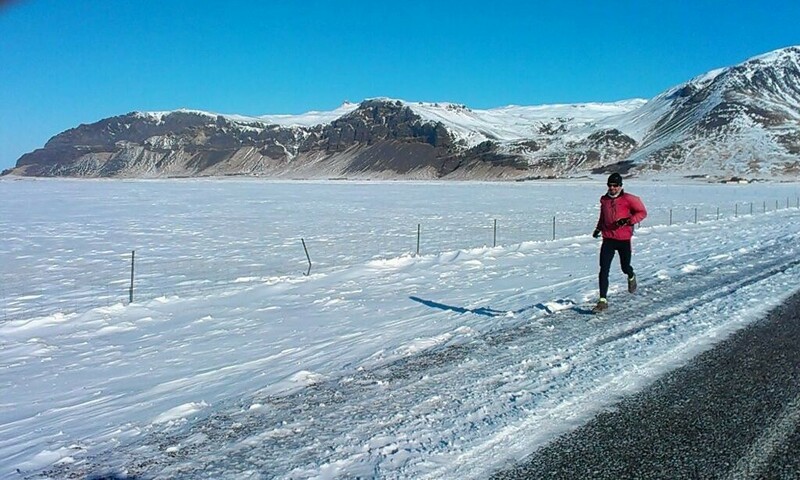 So there is no perfect solution – unless you stick to running on days like these! My Inov-8 Roclites have just done 1000 miles. I’ve had the shoes for exactly a year and have used them as a bit of a workhorse, being my favourite training and work shoe. They are the 282 model in a women’s size 6.5 (My old Roclite 285’s were discontinued and the 295’s didn’t come any smaller than size 7 in men’s – hence the choice) They are the shoe I used for the majority of last winter’s training and for most of this year’s training on fell terrain. I also used them for when my training required a shoe that could cope with both fell and trail running terrain. They aren’t my only shoe, I used other models for racing and for training on purely trail terrain and once they got tatty I had to use something newer when working with clients! The conditions that they’ve been used in are mainly those typical of the northern Peak District, i.e. wet, acidic soils, abrasive gritstone and rough heather. It’s quite a testing environment, so how have the shoes fared after a year and a thousand miles of use? 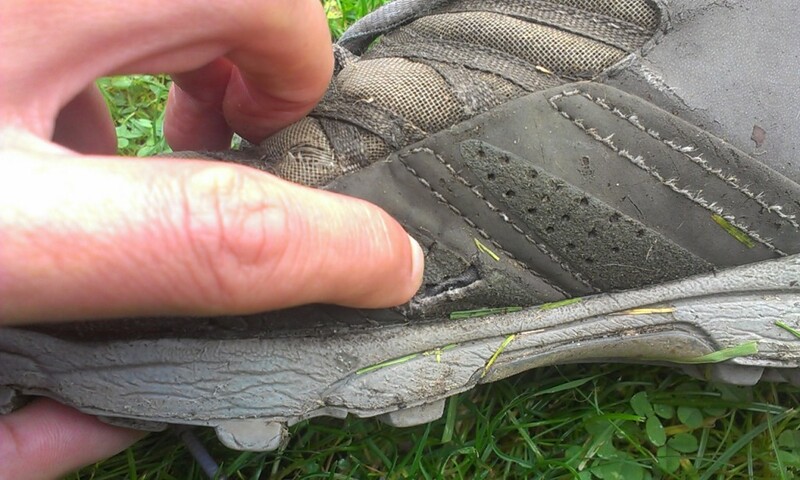 I usually find that it is the upper part of the shoe that fails before the sole. Wet, acidic conditions, rough gritstone and coarse heather all eventually take their toll. The Roclites have stood up pretty well, there are some small holes in the mesh and damage to the rand but they haven’t been holed completely. 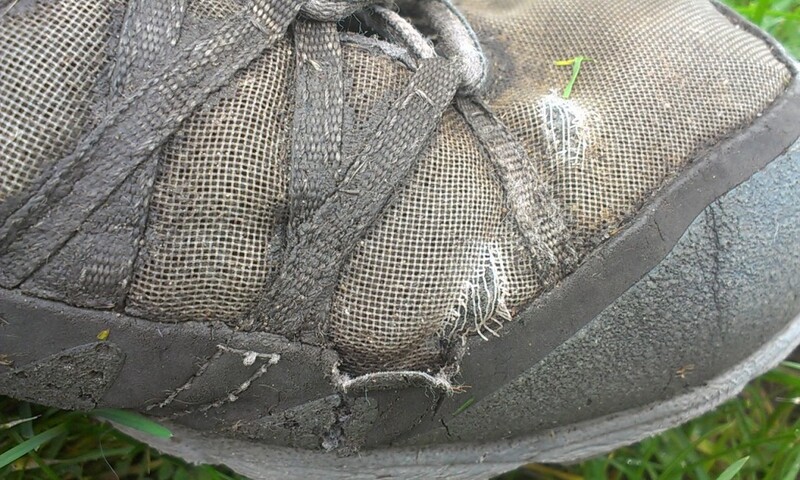 I have been tempted to patch these up with shoe goo but I wanted to get to the magical 1000 miles before doing so! The shoes have also retained their fit, i.e. they don’t feel loose or sloppy and I haven’t found that I need to lace them any tighter than I ever did. 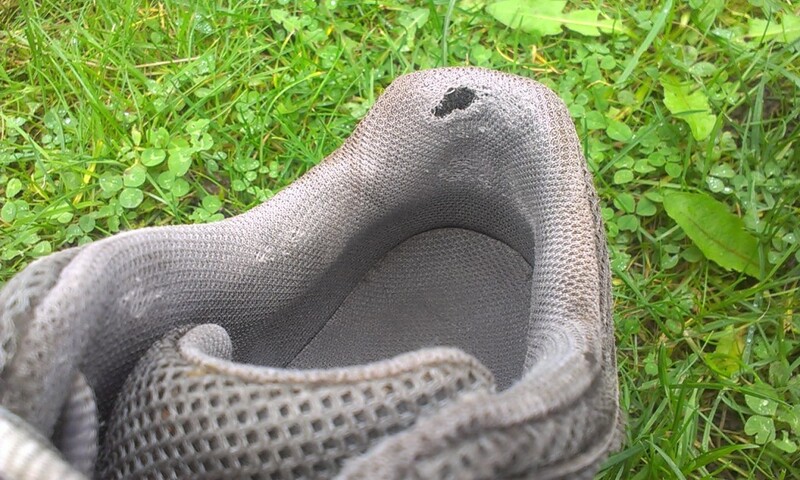 Another area that wears is the heel tab, due to repetitive putting on and taking off of the shoe. Again although the Roclites show some wear here it is less than might be expected after such prolonged use. 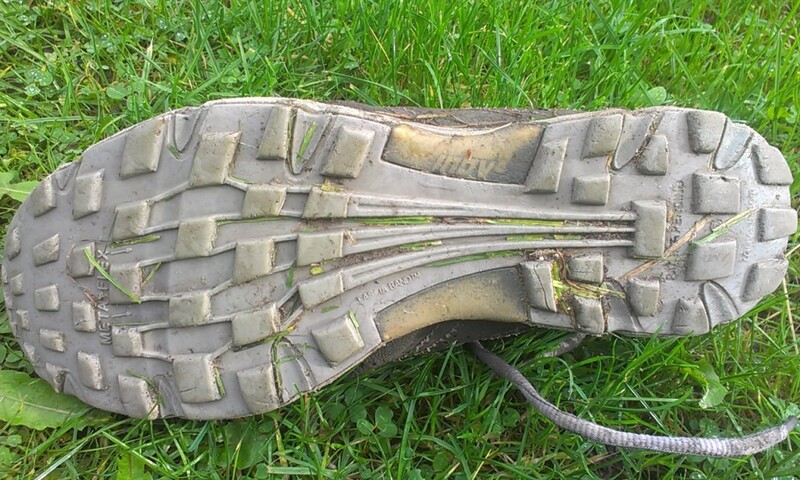 I have found that the Roclite’s sole stands up very well to wear and tear. Even after 1000 miles mine still have a good amount of tread left on them. To be honest they’ve seen better days but it doesn’t take long for a fell running shoe to go from looking pristine to well used, especially when using it in wet, winter conditions. Inov-8 Roclite, one careful owner! So, what to get next? Well I really rate the Roclite, they are a great all rounder and if I could only have one pair of shoes I’d choose these. Their versatility means that I can pack them for holidays knowing that they will cope with the conditions. From running on Icelandic snow to sunny French mountains and wet English fells, they haven’t let me down. 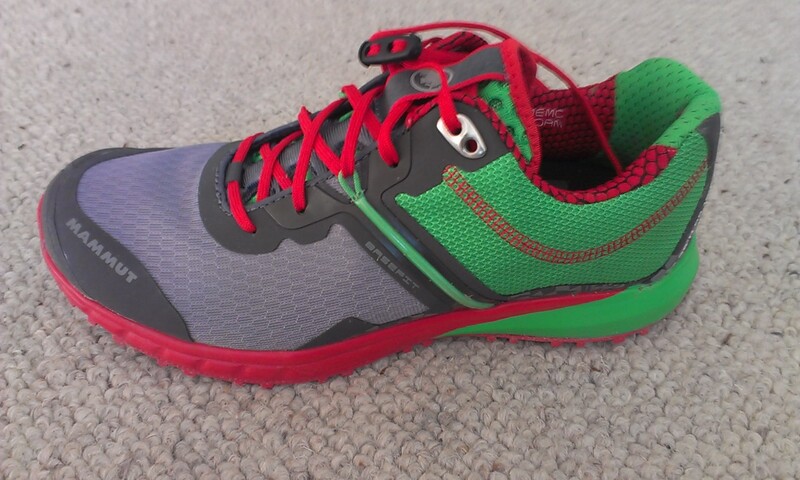 So it would make sense to go with another pair of Inov-8 Roclites seeing as these have served me well. I still have the problem that the men’s 295 and 280 start in a size 7 which is too big for me so might have to go for a women’s model which come in a 6.5. But I might just eke a few more miles out of these whilst I decide! 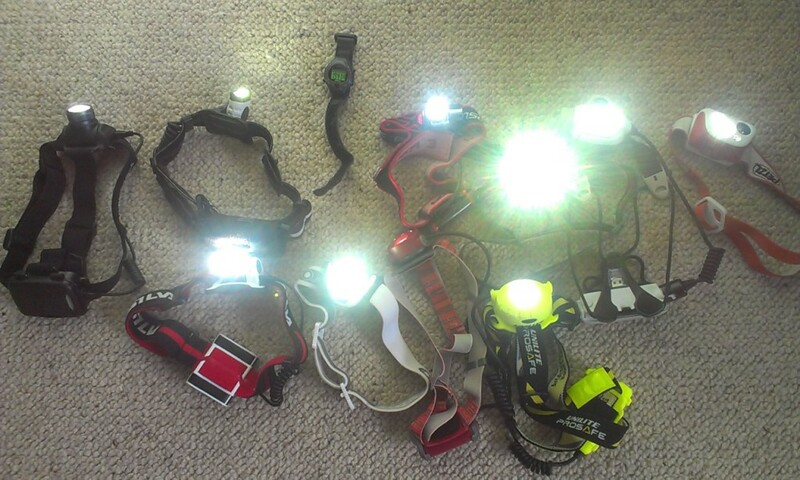 What is the best head torch for running? 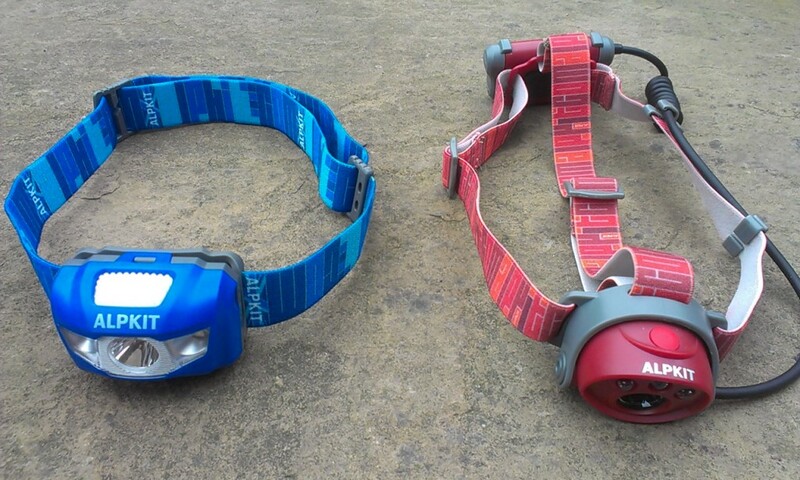 What is the best head torch for running? I’ve heard the question asked lots of times. The answer is a bit harder to determine, a bit like asking which is the best car; whilst a Ferrari might be great for some things it’s not what you’d choose for taking the family on a camping holiday. Go on any forum where the question is asked and you will have people swearing that their torch is the best and that everyone should buy the same model that they’ve got. Well those people are wrong!! What they actually mean is that think they have the best head torch for the type of running that they do. Whilst it might suit them it won’t suit the requirements of everyone. The person who says that their 100 lumen torch is perfectly adequate obviously doesn’t try to run down rocky, uneven ground at speed! is your head torch a Ferrari or a camper van? There is a huge range of head torches to choose from: cheap, dazzlingly bright Chinese imports, torches that automatically react to the ambient light levels, USB rechargeables, AAs, AAAs, 18650s, batteries in the head unit, batteries worn on the back of the head, batteries carried in an external pocket or waist belt, additional white, red and green LEDs, SOS mode, adjustable zoom, combined flood and spotlight…. the list goes on. 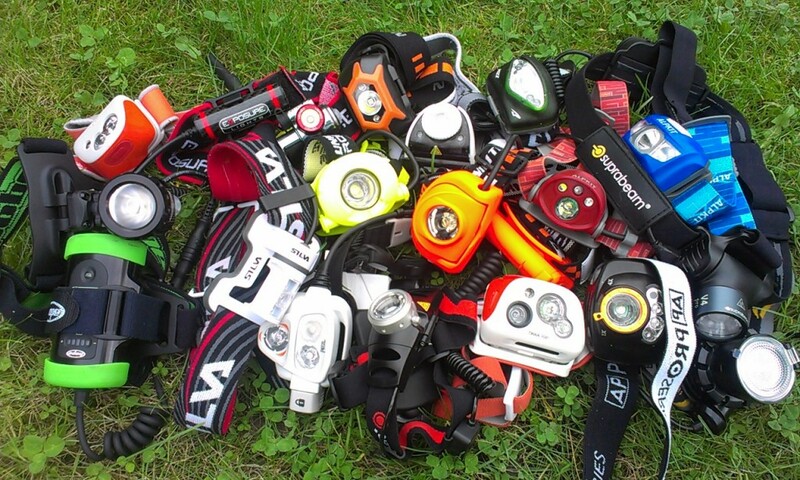 So rather than asking what is the best head torch you need to ask yourself some further questions. What type of running will you do? If you only intend to run at an easy pace on fairly even ground then you don’t need a very expensive or very bright torch. However if you’re planning long nights out on remote terrain then a more powerful torch with long battery life is essential. If you are only going to be running for a couple of hours then again long battery life isn’t vital and so a torch with fewer batteries will suffice. 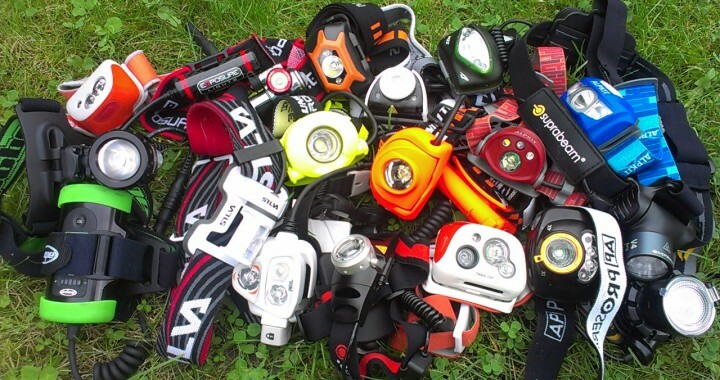 If you think you might progress to longer or more remote running it might be better to buy a torch that will be suitable for that rather than buying one that suits what you are currently doing and then finding that you need to upgrade. Some people mistakenly think that a brighter torch with more lumens is best; ever heard someone say “I got a cheap 1000 lumen torch off Ebay!”? In some situations having a very powerful beam is important, for example when you need to see a long way into the distance, but if you’re night running rather than on a search and rescue exercise then the extra brightness can be overkill. What’s more it can dazzle other runners and dazzle yourself too if you are reading a map! Brighter torches need more powerful batteries which means extra weight, so your mega bright torch might weigh twice as much as your mate’s head torch which does just as good a job. In misty or foggy conditions a bright beam is actually worse than a dimmer one as the reflected light makes it harder to pick out features. More important than brightness is the beam pattern. A bright, narrow beam is good for looking into the distance but doesn’t give a good spread of light. A wider, flood beam allows you to use your peripheral vision to see things rather than needing to turn your head and so is better for running, especially on technical ground. A torch that lets you easily switch between spot and flood is a good option. Do you really need 8 different modes and brightness that is fully adjustable from bright to dim? Is that red night vision mode really useful or is it just another setting that you need to cycle through before you get to the setting you want? What about a rear light; some torches have a rear facing red LED which is great for leading a group, but not for leading a race! Some torches can be turned off by infra red, you just wave your hand in front of them to switch them on and off. That’s a great idea – until you scratch your forehead and accidentally plunge yourself into darkness! Sometimes a simple on / off, bright / dim is all you need. Will it be easy to carry? A compact torch with batteries in the head unit will easily slip into a bumbag or even jacket pocket and can be put on in seconds. This makes it ideal for a twilight run when you don’t need to wear it at first but need it later in the run as it gets dark. That super bright torch with battery pack extension won’t be as comfortable to carry and your mates will have put their torches on and gone whilst you’re still trying to route the cable down the inside of your jacket and into your bum bag! Will it be easy to operate? That might sound a bit daft but some head torches have tiny buttons. They’re easy to operate when you’re in the nice warm shop but what about when you’re out on the cold hillside with your thick gloves on. Will you still be able to feel the button then? Most of the time you won’t need to change the mode whilst you’re on the run but sometimes you might want to turn the torch off to look at the stars or turn it to zoom to look for a field exit. It can be really frustrating if you have to go through a sequence of clicks and holds to to do this, and then again to get back to the setting you were on. Torches with lots of modes are fine, but sometimes less is more and simplicity wins. Also have a look at the battery pack and imagine trying to change the batteries with gloves on or with cold hands. Some can be very fiddly – not what you want to discover on a wet and windy night! Will it fit your head? Again, it may sound obvious but we’ve got different shaped heads! It might be that the torch your mate loves has a battery pack on the back that just doesn’t suit the shape of your head or that your pony tail gets in the way. will the torch be comfortable on your head? Do you believe the hype? If you read the manufacturer’s technical details you might think that your 200 lumen torch has a life of 20 hours on maximum setting. It might last for 20 hours but the chances are that 16 of them will be too dim to allow you to run. Some cheap imports claim to put out a huge amount of lumens, but how do you know that’s accurate? Dare you trust a cheap import? It’s true that you can pick up a very bright Cree LED torch for less than £20 on Ebay and many people have bought them and are happy with them. But there are others who have had them pack up and even catch fire or explode whilst charging! Are those UltraFire batteries that came with it really the genuine article or are are they fakes? If it does stop working you’ll be out of pocket as you won’t be able to send it back but that might not be your only concern. If the lights go out on a country lane close to home it’s not the end of the world, if you’re up a mountain in the middle of the night it’s more serious. So depending on what you’re using it for you might want to think about paying a bit more for a torch from a reputable company. Can you justify buying two? Anyone from a cycling background will know that it’s perfectly acceptable to have more than one bike, even if they cost thousands of pounds each! Likewise you might justify that you can own more than one head torch; a powerful one with long battery life for serious outings and a lighter one for less challenging runs and as your “back up” torch. it’s ok to own more than one torch! 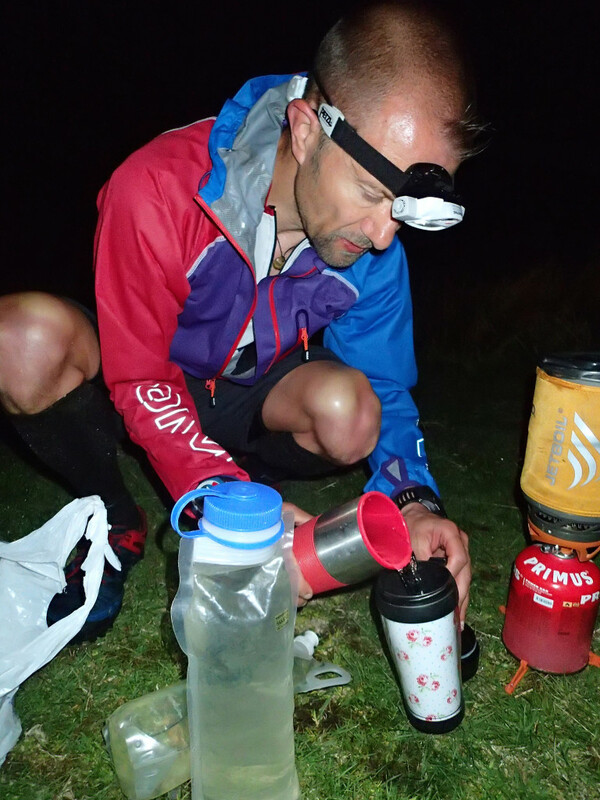 I’ve tried lots of different head torches in different situations, from long night outings such as the High Peak Marathon, the Paddy Buckley round and the Charlie Ramsay Round to short fast training sessions in the dark. 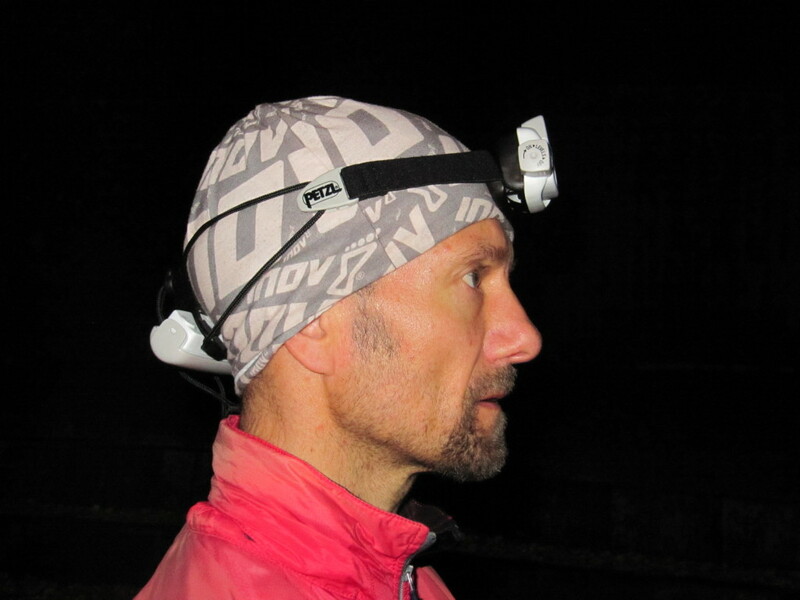 I use a head torch whilst coaching on winter evenings and whilst leading off road night runs. I’ve also tested different torches for various magazines and the thing I’ve found is that there isn’t a “best torch”. There are torches that are really good for the type of running that I was doing at the time and torches that weren’t suited to that type of running. Even the most expensive torches lack some features that could be useful. The first torch I bought was too bulky, the second had poor battery life and let me down on a night race. Only now on my third purchase have I found what works best for me for the majority of the running that I do – but this won’t suit everybody – and even still I use other torches for other runs. So there’s no such thing as the best head torch for running, just an ideal torch for the run that you are currently doing, but tomorrow’s run might be different! Not sure what off road shoes to buy? 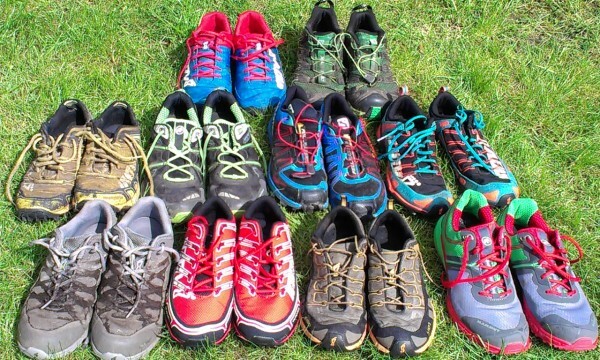 Here’s an extensive list of reviews of fell and trail running shoes. The Montane Spine Race is arguably Britain’s most brutal race. 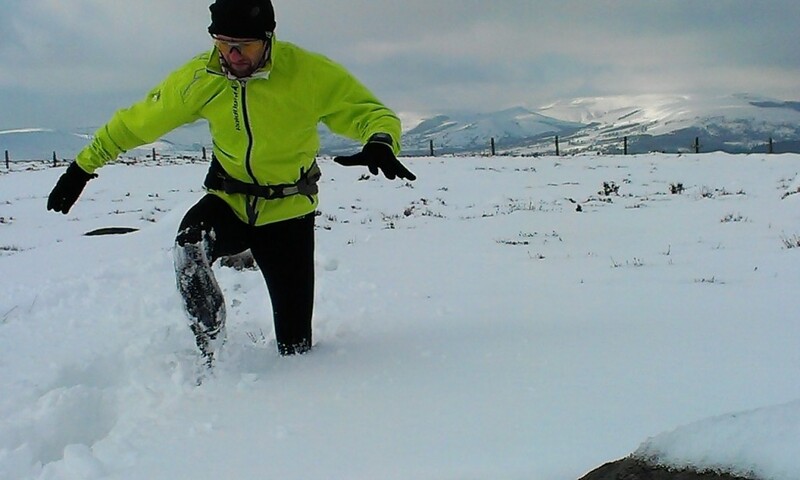 Runners have 7 days to cover the entire 268 miles of the Pennine Way.. in the depths of winter. This film by Summit Fever Media follows the 2015 event and gives an insight into how tough the race really is. The Spine – Britain’s most brutal race? The film follows a number of competitors on their adventure and captures their raw emotions; from despair at having to drop out due to injury, the sense of serenity at being alone in the bleak, wild landscape and the relief and elation on completing their epic journey through remote terrain in harsh, winter conditions. Interviews with competitors, race organisers, medical and safety crew along with footage from the film crew and competitors (carrying Go Pro cameras) give a behind the scenes look at the logistics and planning as well as showing the extreme conditions that the runners encounter. For some there is camaraderie as they assist and accompany each other. For others there is isolation; alone, battling against the elements, their own emotions and sleep deprivation. It might inspire you to do the race or it make you say “never”. Either way it gives a fascinating look at the men and women who plan, organise and compete in arguably Britain’s most brutal race. Socks are just socks aren’t they? They keep your feet warm and stop your shoes from rubbing. Well maybe that’s so for some socks but others are a little bit more technical. 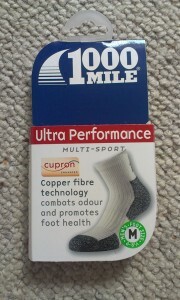 Take the1000 mile Ultra Performance sock. Not only do they have extra padding at the toe and heel where most impact occurs, and airflow channels on the top to help let your feet breathe, they are also made with Cupron copper fibre technology. So, what’s that? Basically, copper oxide is integrated into the fibres of the sock in order to combat bacteria and fungus and so keep your feet healthy and odour free! Is it a gimmick? Well fell running comes with the inherent risk of damp or wet feet. I spend a lot of time with feet that are moist at best, soaking and muddy at worst and no doubt in an ideal climate for bacteria to thrive! Anything that can help keep my feet healthy is worth considering and at a tenner a pair they aren’t going to break the bank. The 1000 milers are comfortable and easy to put on (unlike some other brands!) They also have a clever little touch; the toe seam is a different colour for different sizes – great if you have similar pairs for different members of the family. I’m not sure if I’ll actually get one thousand miles out of them and I doubt they’ll make me run any faster but at least I won’t have smelly feet! 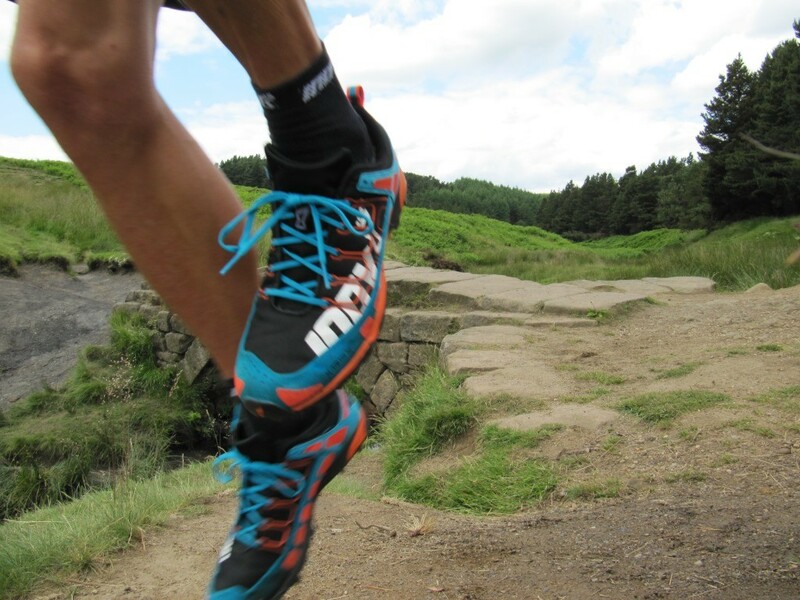 One question that I'm often asked is "What are the best shoes for Fell Running?" The answer is simple; "It depends..."
Ok, simple but not very helpful! That's because there are a number of things to consider before making a purchase so you need to ask yourself a few questions. The term "Fell Running" covers a wide variety of terrain including rough mountains, steep grassy slopes and hard packed trails. Different shoes will be suited to different types of terrain. What will I use them for? Are they for for training or racing? Your day to day trainer can afford to be a little bit heavier than your racing shoe where you might be concerned about saving weight. Likewise with grip; a steady run requires less grip than when you're going eyeballs out with your nearest rival breathing down your neck! We know what the British climate is like and a firm, dry path can change into a quagmire after a week of heavy rain. Shoes that were perfectly adequate one week can have you slip sliding away the next. Quite often a run or race will include several changes of terrain. The Moelwyns fell race in Snowdonia starts and finishes with a long section of hard quarry track where road running shoes would be fine, however the seven miles in between involves steep, wet, grassy descents where a shoe with an aggressive grip is vital. 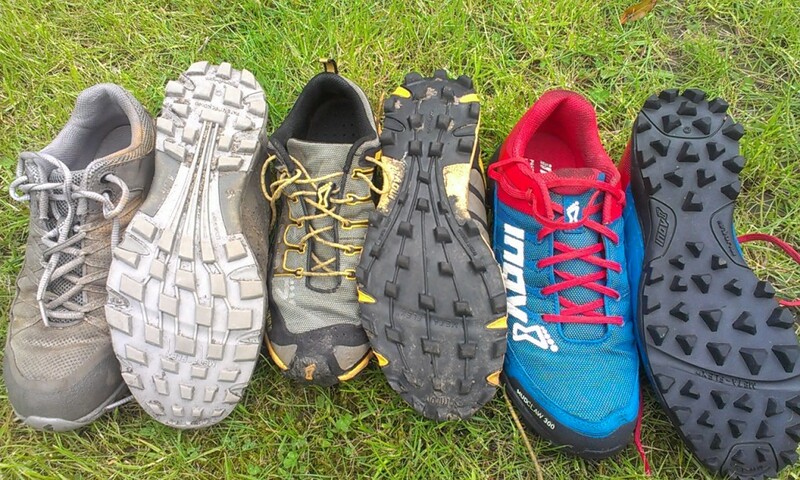 The 3 Peaks Race swaps between fell and road and runners have been known to change shoes for different sections. mixed terrain? you could always try this! This requires a shoe with the most aggressive grip. Weight is less of a concern. This still requires quite an aggressive tread but I look for something lighter in weight. There are several shoe manufacturers to choose from. The once ubiquitous Walsh is nowhere near as popular as it was although some runners still swear by it. 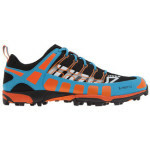 Inov-8 seem to have taken over as the leading brand and have a huge range of shoes to choose from. Salomon have also appeared on the market and have a range of models to suit different conditions. 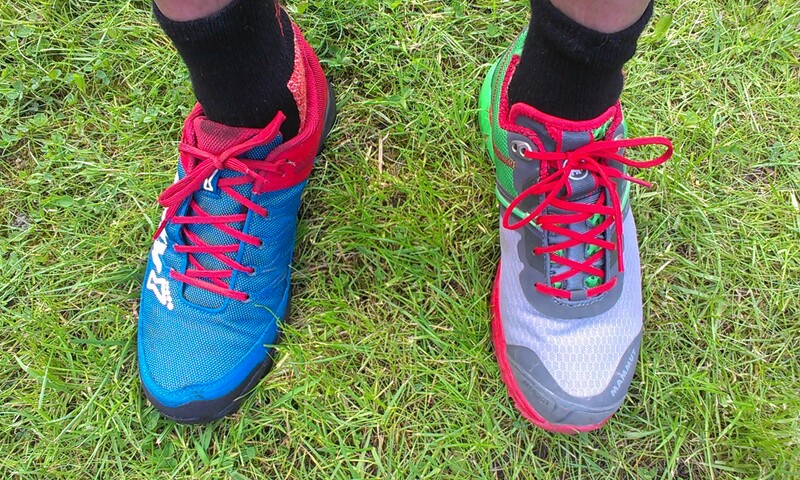 Personally I use Inov-8 shoes for the majority of my training and racing. The Mudclaw is my weapon of choice for winter running and racing, it's super aggressive sole is what I have found copes best with the Peak District bogs. 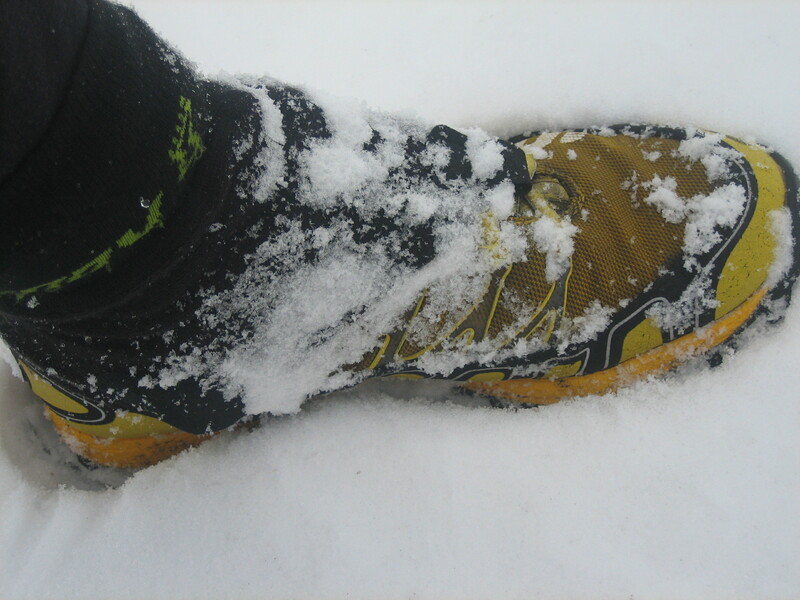 For most other races out of the winter season I opt for Inov-8 X Talons. The 212 are a good lightweight shoe with an aggressive grip that work well in a range of conditions. I find these too lightweight for day to day training so they are saved as my race shoes. For the majority of my running I need a comfortable shoe that can cope with a mix of terrain and I am currently on my third pair of Roclites. These are my favourite workhorses and have served me well for a number of years. 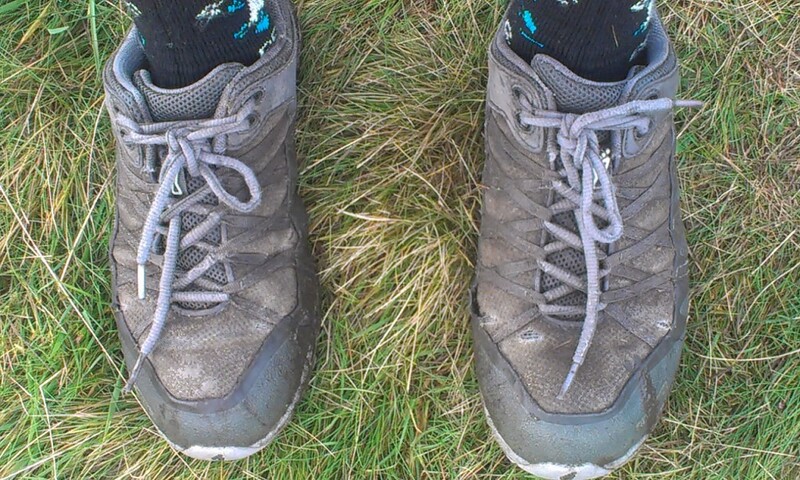 I used them for the Paddy Buckley Round as I needed a shoe that would cope with the mountainous terrain yet provide a reasonable amount of cushioning and comfort. I liked them so much that I literally wore them until they fell off my feet! Roclites, my faithful workhorses - they didn't look like that for long! If I could only have one pair of shoes it would be the Roclites, for me they are the best all rounder. So the best shoes for fell running? It depends on a number of things and you're most likely going to need more than one pair. One thing I'm sure of; there's always room in the cupboard for another pair! 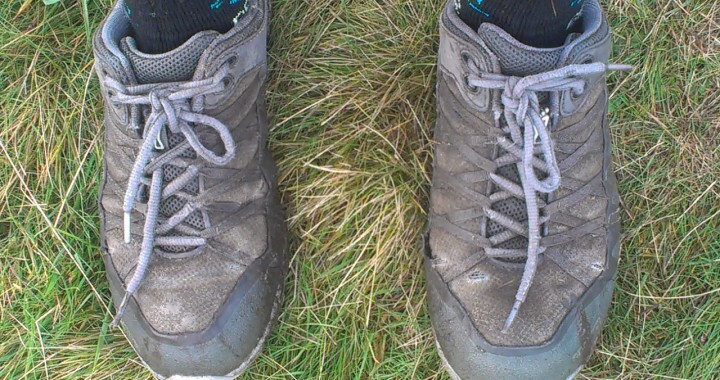 Note - I am not sponsored by Inov-8, this post is based on my experiences of shoes that I have purchased myself. 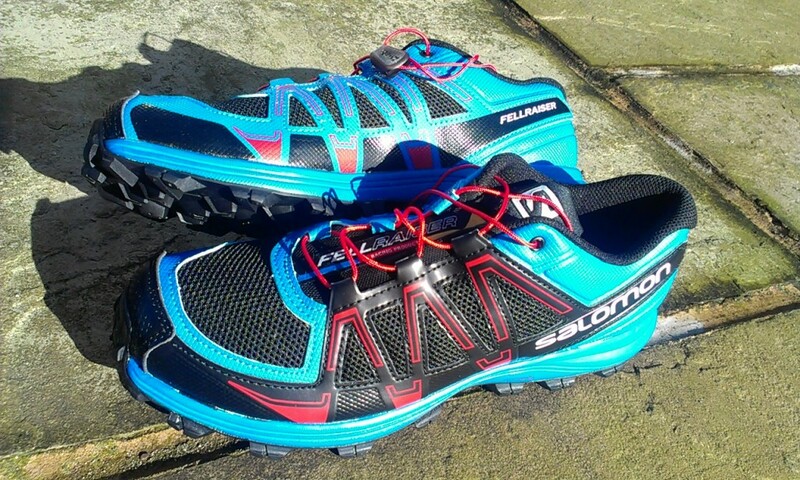 Salomon’s Fellraiser is a recent addition to the ever growing fell running shoe market. 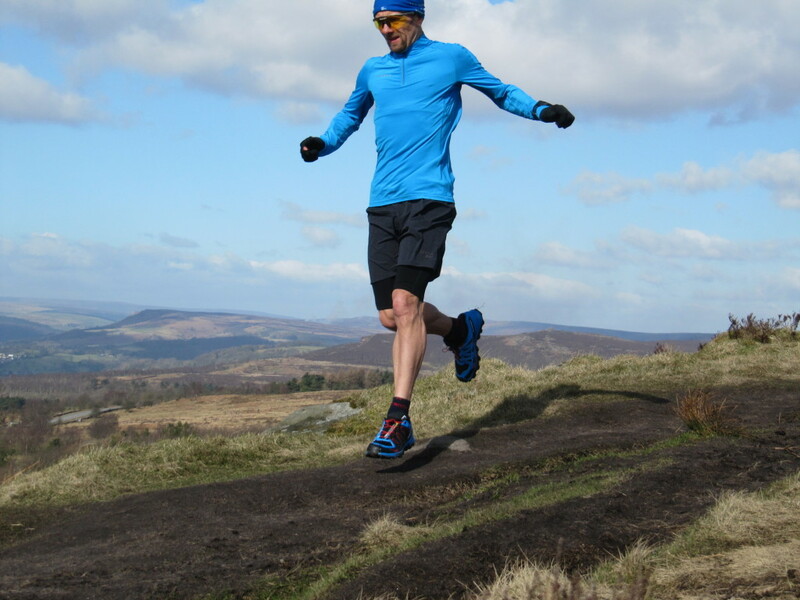 My only experience of wearing Salomon shoes is their XA Pro trail running shoe which aren’t really designed for most of the running I do so I was keen to get my feet into a pair of their dedicated fell shoes and put them to the test. The Fellraisers aren’t the lightest fell running shoe on the market, my pair of size 6.5 tipping the scales at 542g but then they aren’t designed as a stripped down, super light race shoe and they look and feel like they are built to last. The uppers have a tough, stitched rand with a breathable mesh which lets water in, but also allows the shoe to drain and dries quickly. 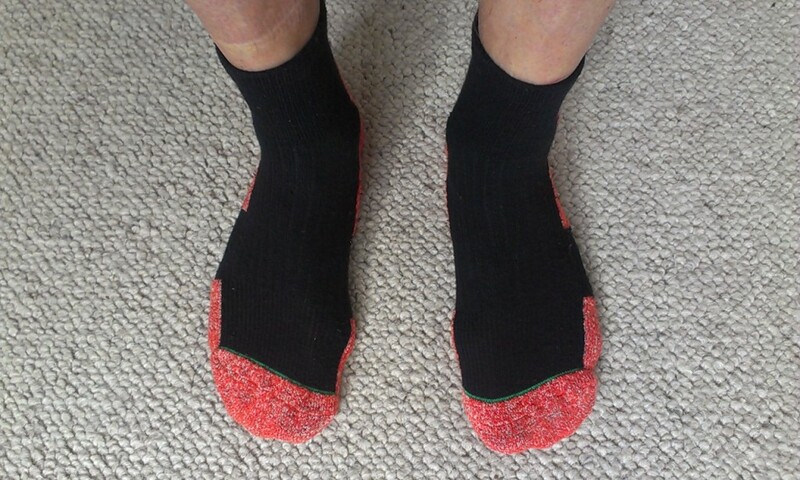 A substantial toe cap gives good protection for when running quickly over rocky ground. 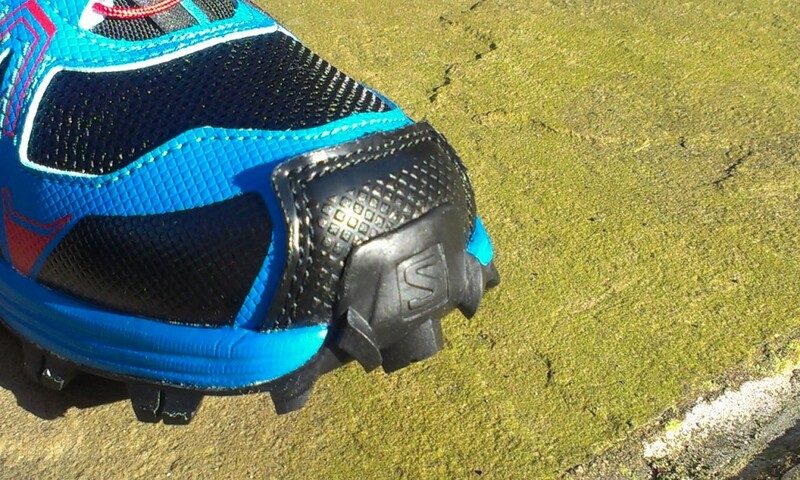 The 6mm drop from heel to toe makes them a lower profile alternative to Salomon’s more established Speedcross shoe. The outsole sports aggressive, multi-directional lugs that feel like they are made of a harder compound than the Speedcross’ chevrons. Hopefully this means a good amount of mileage before the lugs wear down and grip is compromised. 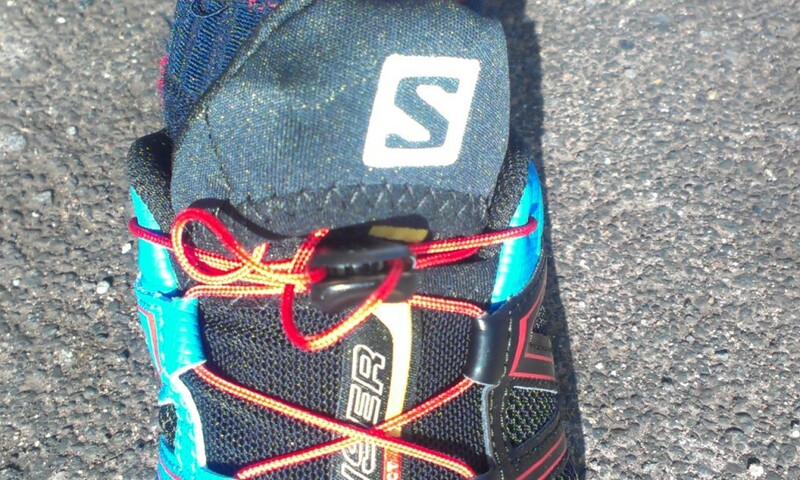 The lugs extend all the way to the toe giving grip even at the “toe off” phase of the running stride. The Fellraisers use the Quicklace™ system that allows the lace to be quickly pulled tight with the excess then tucked away into a little pocket on the tongue. An OrthoLite® liner gives added cushioning whilst claiming to keep the feet healthier due to its fungus resistant properties! 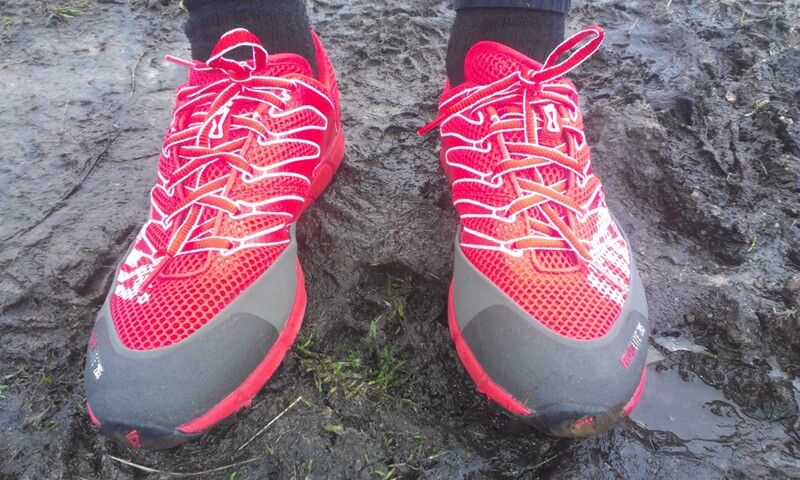 First impressions were that the Fellraisers were a little narrower than I was used to, not uncomfortably so and in fact giving a reassuring responsive feel but maybe a little too tight for very long races. However I took them straight out of the box and onto a 13 mile, multi terrain run with no ill effects. 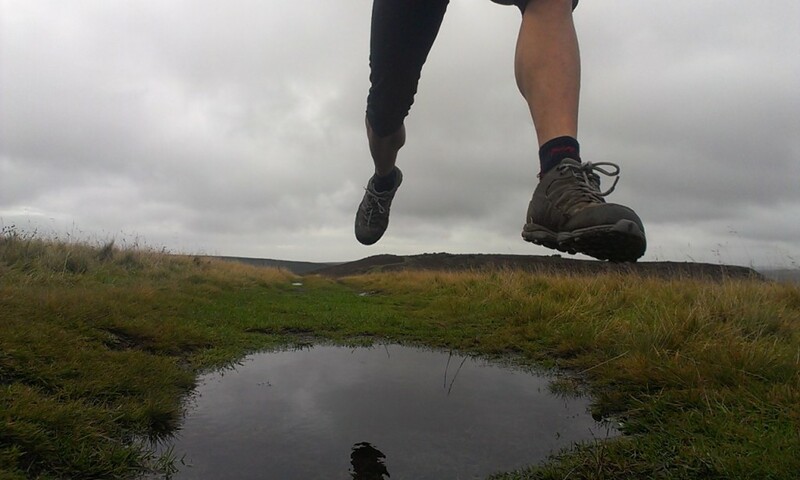 The most essential feature of any fell running shoe is how well they grip in a range of conditions. The Fellraisers gave a secure grip on short grass and felt very reassuring in the peaty Peak District mud. 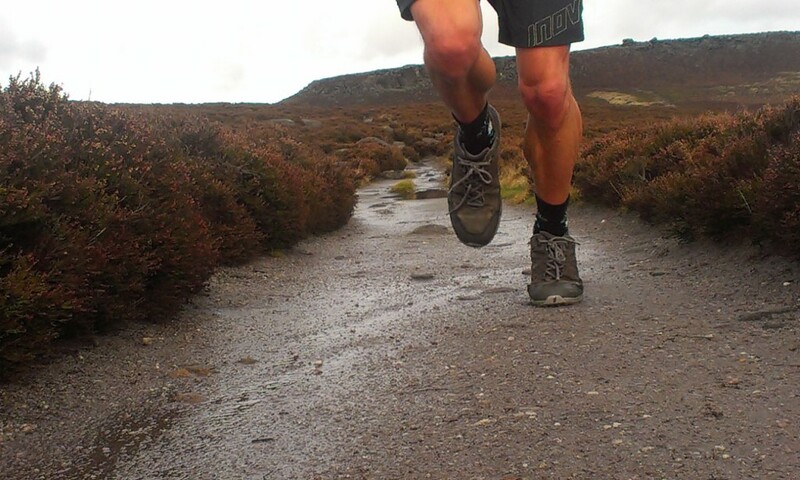 In wet conditions I didn’t have any problems running over rough gritstone but on limestone I found them to be pretty slippy to say the least! 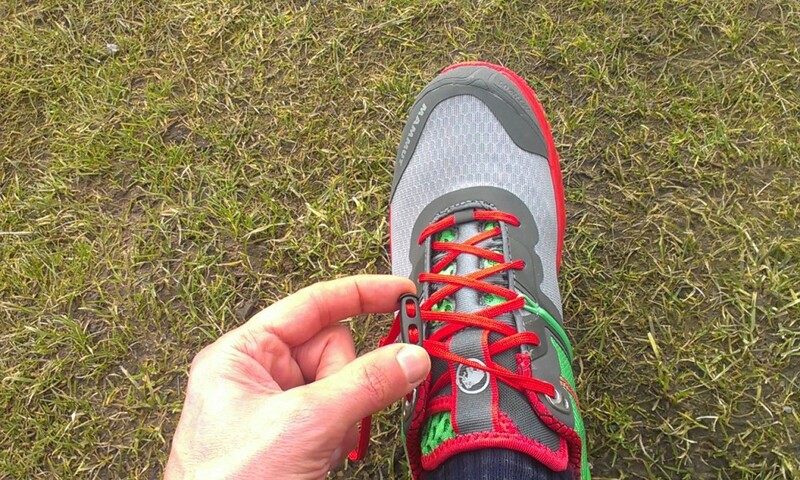 The Quicklace system kept the shoes tight without needing any adjustment and whilst it worked well in dry conditions I found it to be a bit tricky to undo when the lace was muddy or gritty when it tended to clog up. 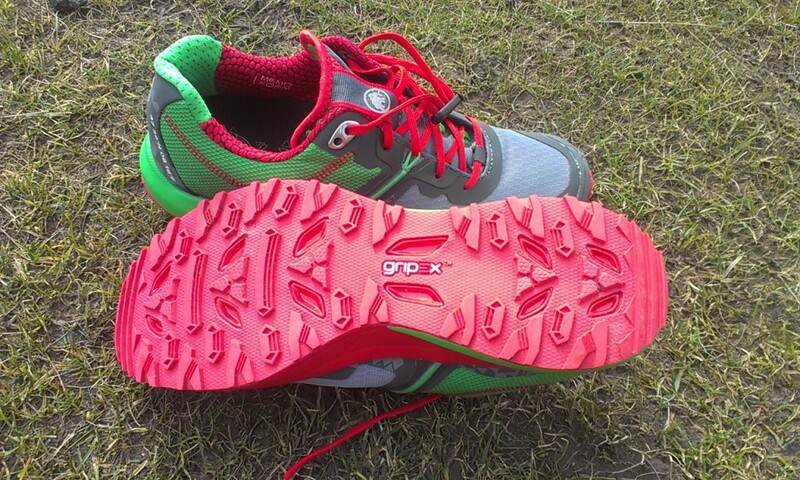 The Fellraiser makes a good training or race shoe over soft ground. 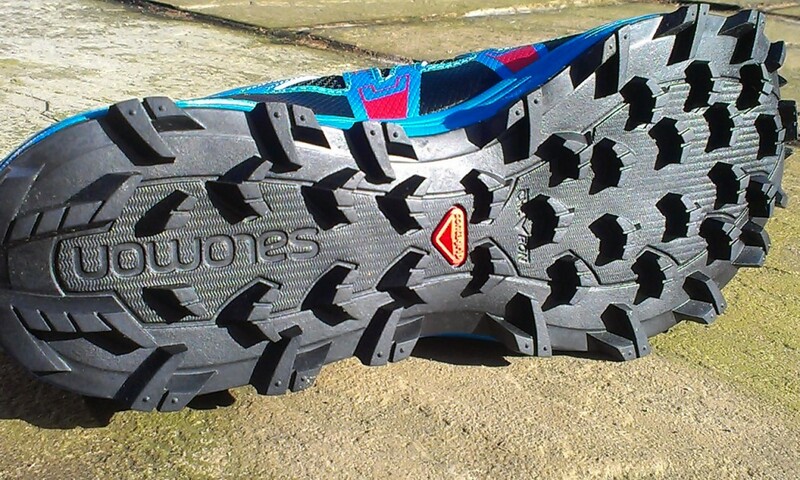 They perform particularly well in muddy conditions and so would make an excellent choice for winter training and racing. As with most fell shoes care needs to be exercised if running quickly over wet rock! They come up a little tight on me so definitely try before you buy. Most of my running is done on terrain that requires a good grip, especially in winter when even some of the less arduous paths and trails are still muddy. That means wearing a full on fell running shoe but with spring, and hopefully some warm, sunnier days on the horizon, some of the trails will dry up enough to warrant wearing a trail shoe. Mammut isn’t the first brand that springs to mind when thinking of trail running but they are becoming more recognised by trail runners, as testified by their sponsorship of the Dig Deep Peak District races including the Ultra Tour of the Peak District. 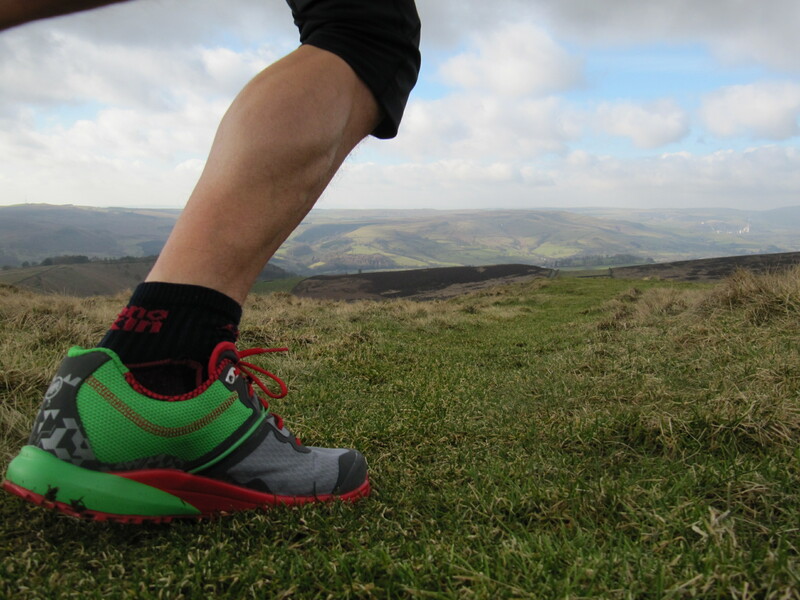 So I was keen to see how their MTR 201 Tech Low shoes coped with some fast running on the Peak District trails. 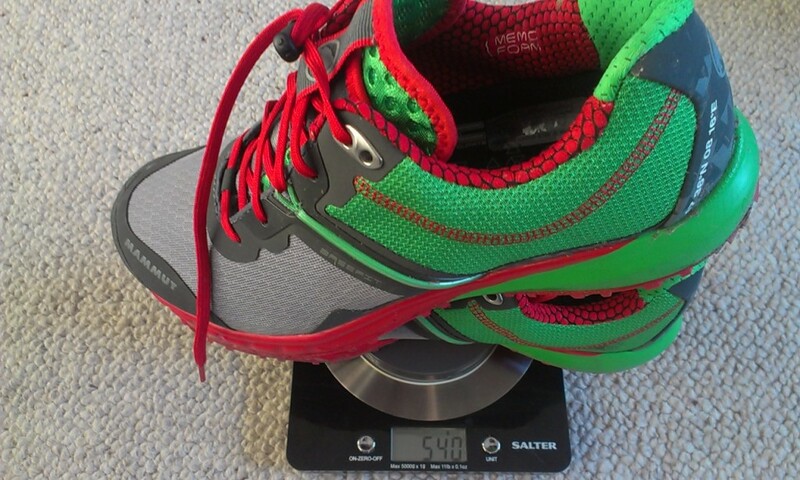 Fell running shoes tend to be pretty lightweight so I was expecting the 201’s to be heavier than I am used to and indeed they are, although at 540 grams for a pair of size 7’s they aren’t too heavy and certainly didn’t have me thinking I was wearing lead boots! Straight out of the box they felt comfortable and not too “clunky”, something I’ve found with trail shoes in the past. Mammut haven’t gone down the “barefoot” road and the 9 mm heel drop is slightly more than the 6 mm of my fell shoes but to be honest wasn’t too noticeable on undulating ground. I’m usually size 6.5 but needed a half size up, the 7’s fitting fine. The upper is a mesh construction which should breathe well and hints at being good for summer training. A rubber toe cap gives some protection from stones and stubbed toes. 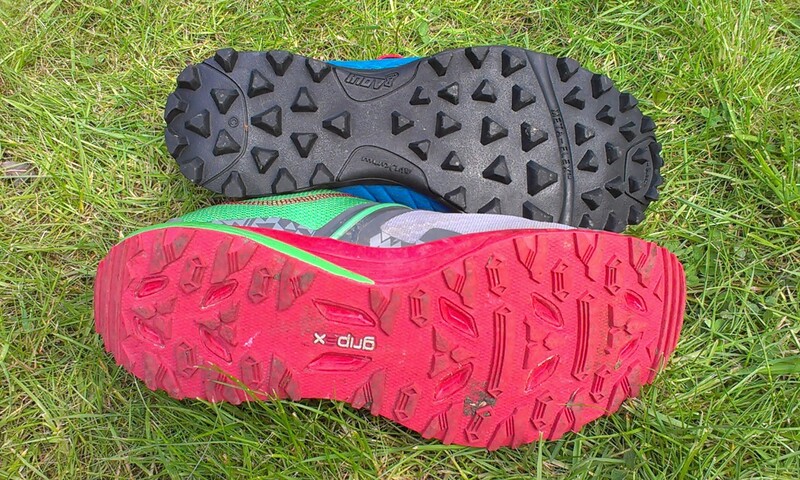 The Gripex™ sole has a much shallower tread than all my fell shoes and whilst it coped well on short, dry grass and hard packed trail it did have me sliding around on the odd muddy patch that I encountered so I would only want to use it for dry conditions. My first run in the 201’s was a fast paced 20 minute effort on hard packed trail and I was pleased with the level of comfort and response. In particular I liked the fact that I didn’t feel any pressure on my Achilles tendon as I find some shoes are too high in the heel cup. One thing I don’t like is the Speed Lace system. This is a small plastic toggle designed to allow you to pull the laces tight and stow the excess away without tying a conventional knot. I found that once you’d pulled the laces tight you couldn’t then tuck them away and needed to tie the usual bow (which was made more difficult by the plastic toggle!) On top of that the toggle is fiddly to release, even indoors with brand new shoes let alone with a bit of grit on the laces or with cold hands. It’s not a major issue, you can just take the toggle off the laces and tie them normally. Speed Lace system – a fiddly faff! The RRP for the 2o1’s is £120, roughly in line with the likes of Salomon and Inov-8 and although not the most commonly seen trail shoe, Mammut are stocked by Outside in Hathersage. A comfy, breathable shoe with a moderate heel to toe drop. Ideal for trail running or racing in dry conditions. 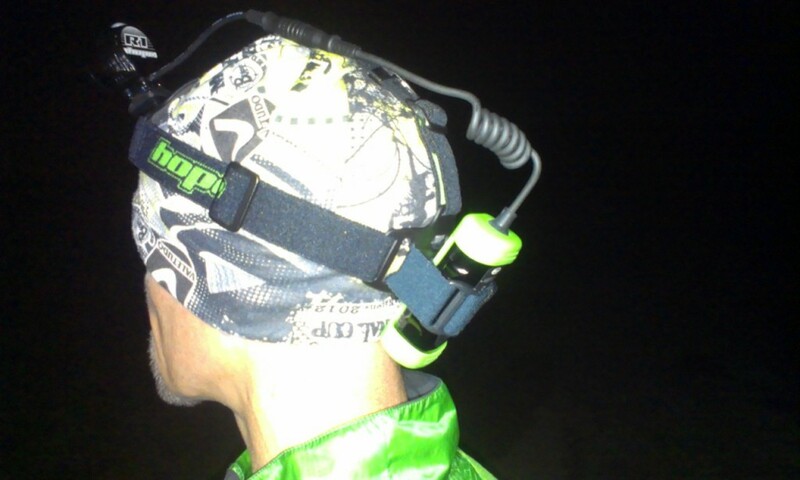 Some types of trail and fell running only require a modestly bright head torch giving a couple of hours battery life. For more serious ventures you need a torch with a bit more power and one that gives you several hours of battery life on a bright setting. 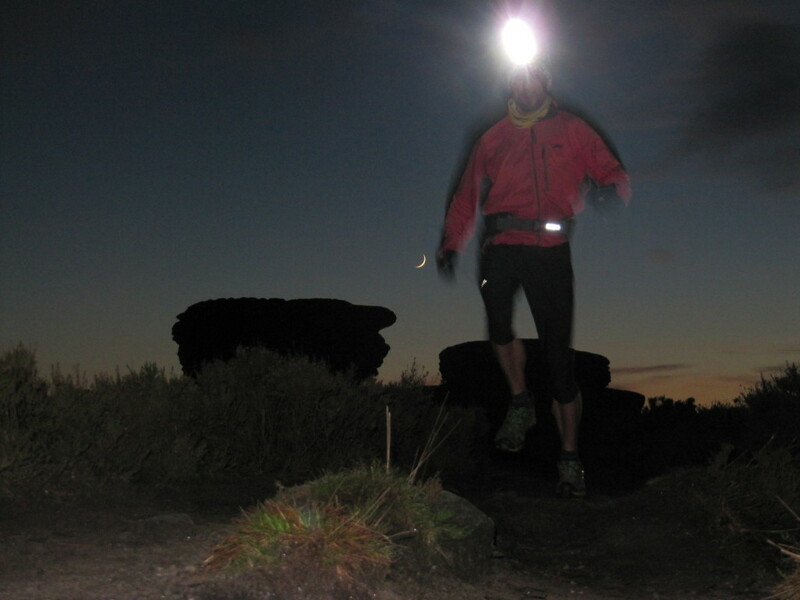 For example an overnight event such as the High Peak Marathon requires runners to spend upward of 8 hours in the dark during which they must navigate across the notoriously difficult Bleaklow, whilst 24 hour rounds such as the Bob Graham require route finding in the high mountains during the hours of darkness. In these situations, having a powerful head torch to see the route and not having to stop to change batteries saves both time and hassle. So is there a head torch that is up to the task? 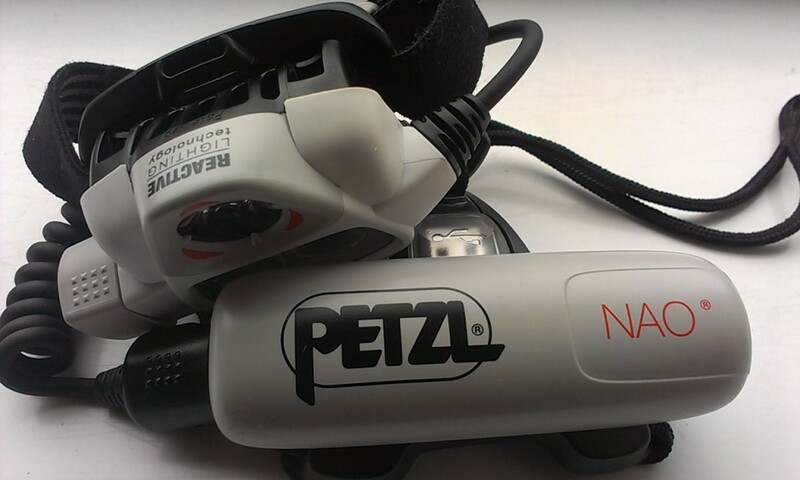 Step forward the new Petzl Nao 575 lumen. Reactive Lighting – is it a gimmick? I’ve heard stories that the reactive lighting gets confused in foggy conditions or by your condensing breath in cold, damp conditions. I haven’t really found this to be a problem although the torch was affected by the glare from the reflective trim on someone’s rucksack when I was following them and it kept flaring from bright to dim. I don’t feel this is a major problem because if it annoys you then you can simply switch to constant lighting mode. 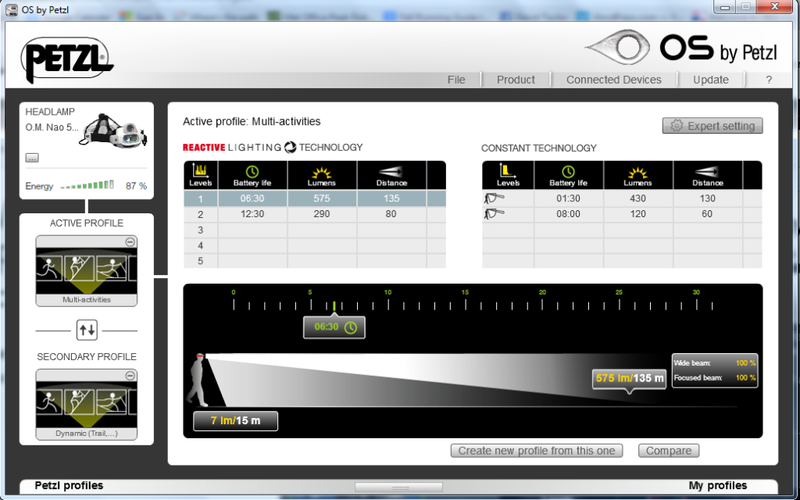 A clever feature of the new Nao is that you can customise the brightness using Petzl’s OS software. You simply plug the torch into a computer with the supplied USB lead and you can change the torch’s settings. For example if you know that you are going to need the torch for five hours you can tweak the settings to allow this. The software allows you to set up different profiles for different activities. To be honest, unless you are going to be in darkness for over 5 hours you probably won’t need this feature. However for an overnight event such as the High Peak Marathon it is really useful to know how long your battery is going to last! Many people won’t use this software but the techie minded may love it! Some torches can be quite confusing to operate requiring a sequence of press, double press, press and hold etc to select the desired light but not the Nao. One big button needs a single twist to turn on (from the locked off position which prevents accidental turning on) and another twist to change between brightnesses. A long twist changes from constant to reactive mode. 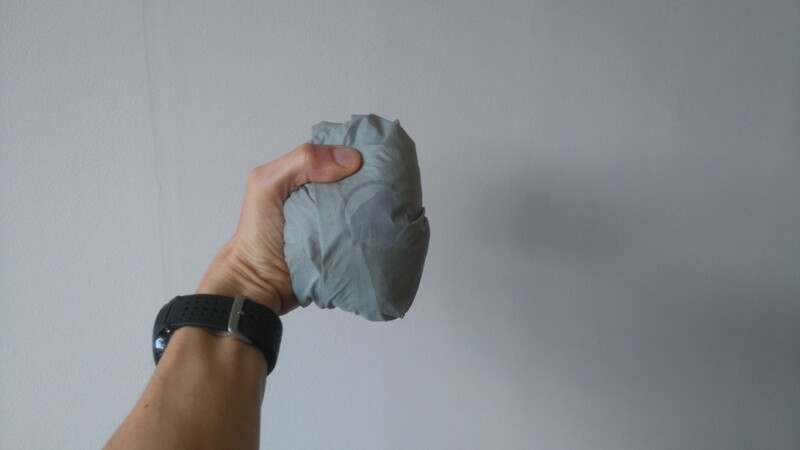 One thing I really like is that the big button is easy to find and twist even when wearing bulky gloves. 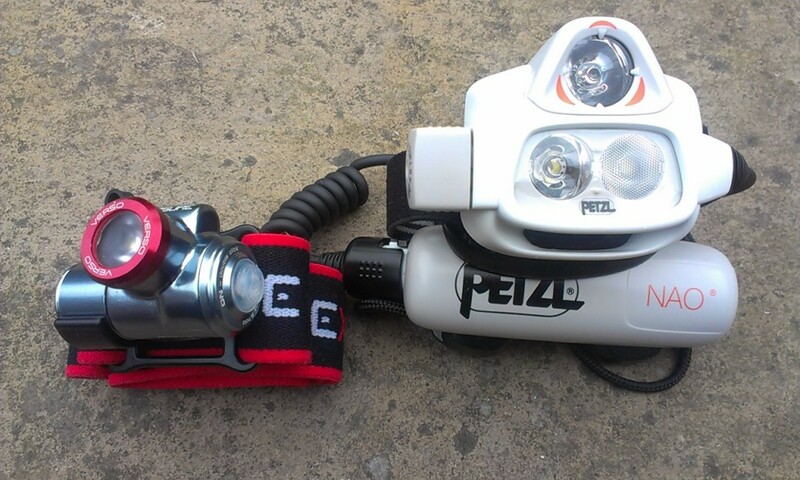 This is a huge advantage that the Nao has over Petzl’s other Reactive torch the RXP which is terribly fiddly to use. A feature that is missing is a flashing / strobe. It’s probably the least used function on your torch but considering that the Nao is the type of torch that you are most likely to take on remote runs I’m surprised that it is missing. The Lithium Ion battery pack is easy to disconnect and recharge, it simply plugs in to a USB charger (so can be recharged via 12v socket in a car). A full recharge takes around 5 hours and three green LED’s indicate battery level. 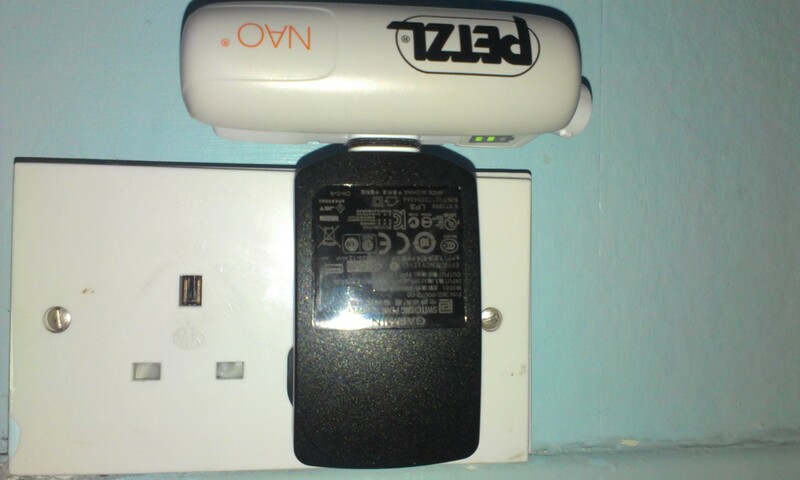 These also illuminate briefly when the torch is turned off so you know how much battery is left. In an emergency the battery can be replaced by two AAA’s but this gives reduced brightness and no Reactive Lighting functionality. The Nao is comfortable to wear and well balanced. The whole unit weighs 185g with the head and battery units being connected by a simple elastic and cord system. An additional over the head strap is supplied but I didn’t feel the need to use it. I’ve been using the Nao over the winter for both guided running and training. I was particularly impressed when on a trip to an unfamiliar forest I was able to run on wet, technical, narrow trails at full pace; it was leg speed rather than illumination that was the limiting factor! As much as the brightness it is the wide pool of light that the Nao gives off that is impressive. Some torches give a narrow beam but the Nao allows you to use peripheral vision rather than you having to turn your head to see objects at the side. 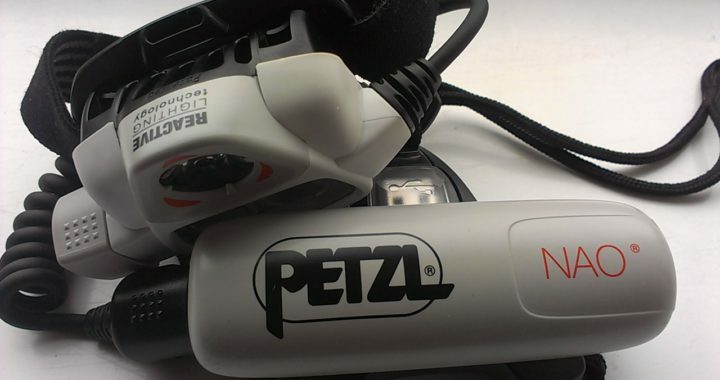 I chose the Petzl Nao for my Charlie Ramsay Round. I needed a torch with enough power to illuminate the rough steep terrain (especially the descent off Chno Dearg) and yet enough battery power to last through the night with no faffing with battery changes. The reactive function also really came into its own, dimming every time I looked at the map then seamlessly brightening as I looked back at the terrain. I also pre-programmed the torch to give me 5 hours of battery life so I knew that it would last until dawn. The power and spread of the Nao’s light is really noticeable when you compare it with other torches. When running in a group one thing you need to consider is that if you run behind someone with a dimmer torch you will put them in their own shadow! Over £100 is a lot to pay for a head torch especially as there are some decent torches around for less than half the price. But having used the Nao and got used to how comfortable and easy to operate it is and how it literally outshines the opposition I’d say it is definitely worth it. 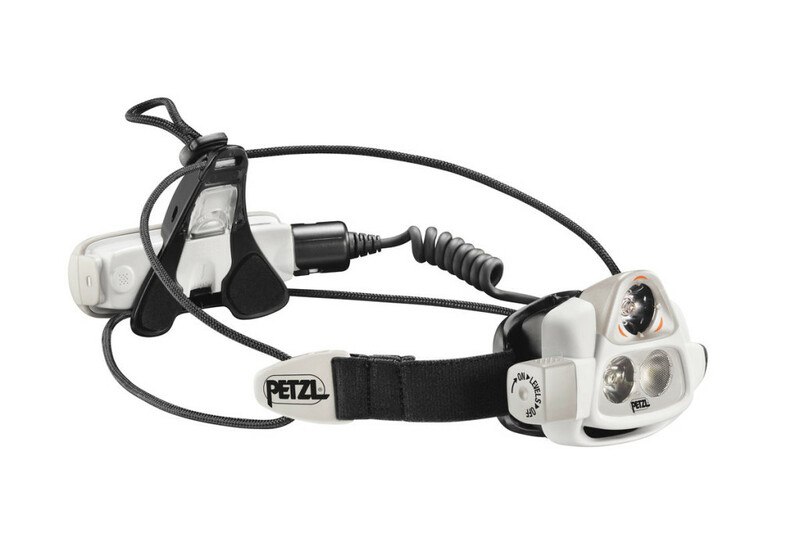 For serious winter fell running or for anyone considering night runs where both brightness and long battery life are important factors, the Petzl Nao is a great choice. Pros: Great battery life, easy to use whilst wearing gloves, simple sequence functions, reactive feature is excellent when map reading. Cons: Expensive, no strobe function.